To the people of Kenton, Ohio, Gene Autry is certainly a hero in a white hat. 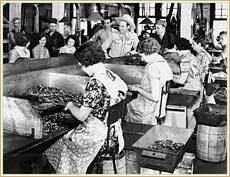 In 1937, the town was suffering from the Great Depression as its main industry, the Kenton Hardware Company, was failing. Once the largest iron toy manufacturer in the world, the company was forced to drop entire lines of toys due to slow sales and employees were limited to working two days per week. Gene visits Joe Solomon at the Kenton Hardware Company, August 8, 1938. 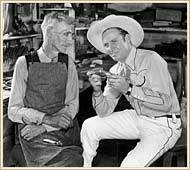 Convinced that one toy could change their fortunes, Kenton Hardware Company vice president Willard Bixler envisioned a deluxe iron cap pistol modeled after Gene Autrys own pearl-handled six-shooter. Bixler contacted Genes agent Mitchell J. Hamilburg, who was receptive to the idea. Gene then sent one of his six-shooters to Kenton as a model. Master toy maker Joe Solomon created the mold for the smaller version and added Genes signature. The completed toy had a gun metal finish, simulated pearl grips, and retailed for fifty cents, expensive for 1937. The Gene Autry Repeating Cap Pistols were extremely popular; by 1939, two million were sold in the United States and abroad, including Latin America and Europe. Carl Drumm, the "Rambling Reporter" for the Kenton's News and Republican, wrote, "The capacity of the local plant was severely strained by the rush of orders that followed introduction of the cap pistol. The force was doubled, and still the plant was unable to keep up with the demand... so the local plant operated day and night, and some work was done in another factory." Gene became known as the towns "economic savior" and the pistol the "toy that saved an entire town." The Gene Autry Repeating Cap Pistol eventually gave birth to other versions, including a junior model, a dummy play gun, and a New Engraved shooting iron. Because of these toys, the Kenton Hardware Company flourished well into the 1950s. Gene at the Kenton Hardware Company, August 8, 1938. Kenton declared August 8, 1938, "Gene Autry Day" and celebrated with a rodeo, track and field events, and a softball game. Best of all, however, was the personal appearance by Gene Autry and Champion. They toured the factory and appeared at the Kenton Theatre, where they played five performances to more than 4,500 people. That night Gene had dinner at the home of Willard Bixler. In 1994, the Hardin County Chamber of Commerce contacted Gene Autry with the idea of holding a special festival to celebrate his connection to Kenton. Gene was deeply honored, and the idea was approved. Gene Autry Days has been held every June since, featuring musical performances, vendors selling Western items, and other attractions, such as cowboy look-a-like contests and continuous Gene Autry movies. 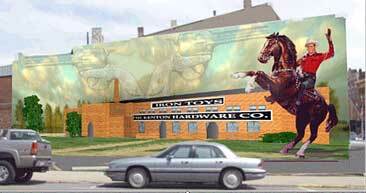 In June 2004, a brand-new mural with a larger-than-life portrait of Gene and Champion was dedicated, cementing the long-standing connection between the Cowboy and the town. Click here to visit the official Kenton, Ohio website. Use the links below for information on Gene Autry Days in Kenton, Ohio.